Welcome to the BUNKER, the men’s club in Dresden! 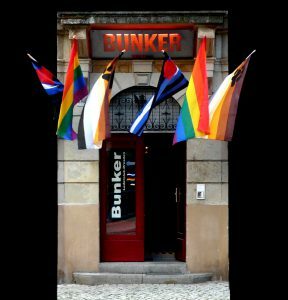 BUNKER, with its 3 different floors, is the #1 place for gay blokes from Dresden and the city’s guests at every weekend and before public holidays. BUNKER is the right place for meeting and/or dating someone. The “heart” of our club is the bar room. There you can make your first contacts, talk, or start to explore the different rooms. The decoration and the equipment are exceptional, camouflage-style, and very functional. You will stay in an oasis provided with military clothes, uniforms, and some special equipment to play. Believe us, you would never dream of finding a place like this whilst passing by the building outside. Come by and make your own experience. We don’t want to tell too much. Our cosy and original BUNKER is a place for easy-going people. It is well-known all over Europe and is highly regarded. Do not be shy. Just ring the bell at the entrance. We are looking forward to meet you. Please note dates! Events with special topics can have irregular opening hours.